Crooked, cracked, and discolored teeth can affect the way you interact with the world. If you have a smile you always hide, you might find yourself avoiding or missing out on life’s biggest events, such as going on that first date or auditioning for the lead role in a play that you just know is meant for you. Cosmetic dentists Drs. Oh and Couto believe that providing ongoing, extraordinary dental care means offering a variety of cosmetic dentistry services, so that our patients can feel proud of their smile during life’s most important moments. Cosmetic dentistry consists of a suite of services designed to improve the appearance of your teeth. These services allow our Palmdale cosmetic dentist to brighten, straighten, or reshape your smile so it reaches its full potential just in time for your next big opportunity. At AV Sierra Dental Center, we specialize in crowns, gum lifts, and tooth-colored fillings, as well as many other services that can change your smile in a time frame that suits your needs. Teeth Whitening: Drs. Oh and Couto can brighten your smile several shades with either an in-office or at-home bleaching system. A vital part of our standard of care at AV Sierra Dental Center is taking time to get to know your oral health history, your lifestyle, and your smile concerns so our cosmetic dentist can, in partnership with you, design the smile of your dreams. The cost of veneers varies according to the number of veneers you need, the size, and the location. At AV Sierra Dental Center we will work with you to find an affordable option that is right for you. The cost of dental implants varies according to the number of implants you need and the health of the surrounding tissue and bone. For an estimate of your unique dental implant situation or to find out about our financing options, set up a consultation with Dr. Oh or Dr. Couto today. Call AV Sierra Dental Center today at 661.202.3542 to learn more about our cosmetic dentistry services. 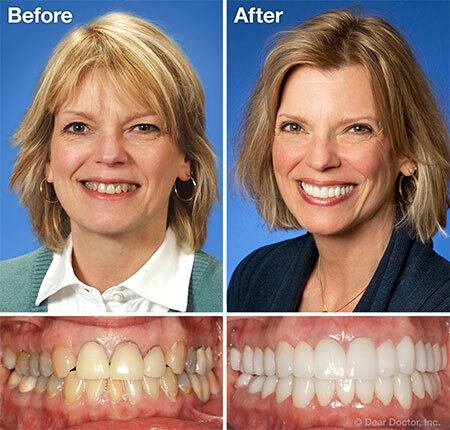 We look forward to serving you and helping you achieve the smile you’ve always wanted.